Chat: Click “Chat with us” to speak to someone right away. Sending biofuel samples to Beta Analytic is easy. Sampling – Unless otherwise instructed, we will subsample the submitted material in a quantity reasonable for the analytical method. If there are any special instructions to ensure the subsample best represents the client’s interests, please discuss with the laboratory prior to analysis. Since the laboratory cannot be experts in all manufacturing processes and products, the responsibility for analysis of a representative subsample lies with the client/submitter. Recommended Container – 1 mL glass micro-sample vial with a crimp top that has a Teflon-lined septum. The vial should only be ¼ – ½ full. Plastic or glass vials with snap caps can be used as containers for biofuel samples. Other examples of vials you may use are found here. Please make sure that the seal of your vials are tight and that the vials are wrapped properly to prevent breakage during shipment. Please make sure the vials have chemically non-reactive seals, e.g. made of a silicone disk with one or two teflon faces. If you use low-volume screw top vials like the amber one above, make sure they have a non-reactive cap liner made from silicone and teflon or some other chemically non-reactive material. Do not use vials that have caps lined with a piece of cardboard with an Aluminum-foil face on one side. The cardboard side is glued to the cap. These are not suitable for fuels or other volatile liquids as the vapors can dissolve the glue and contaminate the sample during shipment. The clear snap caps are also not typically recommended for fuels. 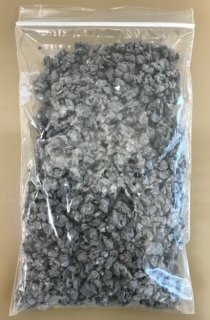 Packing Materials – If you would like to use vermiculite as packing material, please do not use vermiculite powder. We recommend using coarse-grade vermiculite or other material with paper-based filling. Please use Coarse Vermiculite as packing material. BETA does not need information that you feel may breach the confidentiality of your product. 2. Chemicals must include SDS/MSDS – We must have a copy on file. Please include it in the package to avoid delays. If we already have the latest version of an SDS on file for your product, please indicate so on your submittal form. Please send your samples under the guidelines of “De Minimis Shipping” and email us the courier and tracking number. To prevent shipping clearance delays, please use our recommended customs declaration – “Biofuel samples for scientific analysis – NO COMMERCIAL VALUE – Destroyed during analysis”. De Minimis Shipping – Hazardous substances with International Air Transport Association (IATA) Excepted Quantity Codes E1, E2, E4 or E5 and those in Packing Groups II and III qualify for De Minim​i​s shipping. To ship as De Minimis​ to our Miami office​, the sample volume must not exceed 1 mL and the packaging must follow the guidelines in the Dangerous Goods Regulations, being sufficiently absorbent in case of leakage and sturdy enough to prevent breakage. No special labelling is required for De Minimis shipping. For detailed information, please consult the IATA Dangerous Goods Regulations. When sending samples directly to the US, please make sure that the shipping company you choose takes full responsibility to clear the package with US customs. You are welcome to contact us for shipping advice. A Beta representative will contact you to confirm the safe arrival of your samples and to quote you a delivery date for the results. Please read our policy on sample retention and return. IMPORTANT NOTE REGARDING OUR COMMITMENT TO PROMISED DELIVERY AND ASSOCIATED ANALYTICAL COSTS – Analyses are started immediately upon receipt of samples to best ensure we meet our promised delivery. This means that charges are also incurred immediately upon receipt of samples. Change orders are welcome, but please be aware that partial or full charges will apply based on how much work has been completed by the time of the change request.